Happy New Year from your Jefferson County Wisconsin Restaurant Review Crew! We’re back! In years past we reviewed local Fish Fries and Supper Clubs. See our past reviews here. Many thanks to you, our readers, for your feedback – both positive and critical. Keep it coming. We’ll get the hang of this review thing yet! If you have a comment or would like us to review your favorite food hangout, just drop us a line at newsletter@enjoyjeffersoncounty.com. We get our best food ideas from you! Your humble foodie servants have declared 2016 to be THE YEAR OF PIZZA in Jefferson County, Wisconsin. So loosen your belts and make room for gastronomic paradise with one of Wisconsin’s most loved foods: PIZZA! Why do people everywhere love pizza? Think about it: pizza is clearly one of the most versatile foods ever created. So many different kinds of pizza exist. Travel from Italy to Greece to Chicago to New York and even those kooky Californians have put their own spin on pizza. Seems like each region puts their own twist on pizza. Our quest is to simply find the best “Jefferson County, Wisconsin Pizza.” We believe that if we look hard enough, we will find Wisconsin’s most delicious pizza right here in Jefferson County. Pizza is surely a timeless classic. And who will benefit from this glorious pizza quest? Those pizza joints we review? Affirmative. Our delicate palates? Most assuredly. You, our faithful readers? Emphatically YES! Is your tummy rumbling? Where shall we begin? 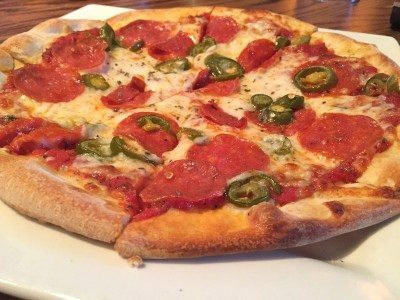 For our maiden pizza review, we began our pizza journey at Fort Atkinson’s Brickhouse Pizza Pub. Brickhouse Pizza Pub which, of course, features pizza front and center right where it should be, also offers appetizers, calzones, pasta, salads and dinner items like steak, fish and ribs. These choices beckon, but we’re here for serious some Wisconsin pizza research. Brickhouse Pizza at 1501 Janesville Av. – Fort Atkinson – is located (in an attractive BRICK building of course!) just a few blocks south of Fort Atkinson’s famous Fireside Theatre. It is obvious that great care has been taken to spread out the comfortable dining space. It’s roomy. Coupled with area lighting, this combination of space and light creates a relaxed ambiance. The atmosphere is industrial chic, warm and comfortable. 1950’s photos and memorabilia along with soft rock and roll add a nostalgic air. Is that Richie Cunningham talking to The Fonz over there? You get the picture. Bar seating is also available and ample TVs will satisfy any sports fan. The wait-staff is courteous, with beverages appearing very quickly. Soft drinks are bottomless and a full bar is available with several microbrews on tap. Opening the menu, 16 specialty pie creations each focusing on different regions are featured. 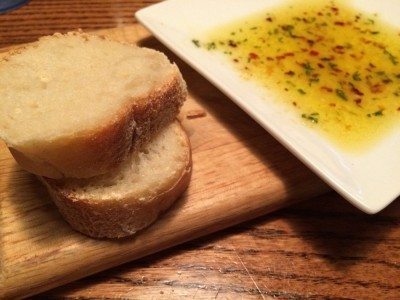 We started out our meal with delicious bread, complete with dipping oil. The dipping sauce included garlic, chopped red peppers, parsley and parmesan cheese. Bellissimo! A few of us opted for the Ultimate Pepperoni featuring extra cheese and two kinds of spicy Pepperoni. We asked if the kitchen could give the same attention to our other favorite – Italian Sausage – and the Brickhouse staff was happy to load it up. Others in our group ordered a few half-and-half pizzas to share. Two with traditional pizza sauce – the Brickhouse Supreme – with pepperoni, sausage, mushrooms, green peppers, onion and cheese; and the Chicken Tuscany with spinach, garlic roasted tomatoes, grilled chicken, mozzarella and feta cheese. The other two pizzas came with ranch sauce (rather than traditional pizza sauce). The Hat Trick had chicken, bacon, tomatoes, mushrooms and mozarella cheese. The California Love had spinach artichoke hearts, tomatoes, feta and mozarella cheese. Let’s start with the all-important star of the show, the heavy lifter, the element that carries the weight of all of the toppings. Of course, I am talking about THE CRUST. Brickhouse, it turns out, has “that crust” I remember from growing up on Milwaukee’s South Side. Thin, of course, and the bottom is kissed lightly with corn meal. You just don’t see that extra added touch anymore. Mmmmm. You will eat it all, every crunchy crumb. Guaranteed. Brickhouse Crust rates***** 5 Stars from this Review Crew! The Mozzarella and Provolone cheeses were stringy fresh as can be in more than ample portions. Creamy Wisconsin gooey greatness. Both kinds of Pepperoni were tasty, with the chunks adding a piquant, spicy kick at the end. The Sausage was tender, not overcooked and rubbery like you get in some places, which allowed the sausage to blend well with the rest of the ingredients. There is just enough Pizza Sauce on a Brickhouse Pizza Pie to complete the package. Brickhouse not-too-spicy-not-too-sweet base tomato sauce resides in the flavor background. Pizza Sauce should not overwhelm the rest of the ingredients. Brickhouse has this important element of pizza construction down pat. It is a smooth sauce with no texture. Would have liked some pieces of tomato in the sauce. Some in our group felt that the ingredients on their ‘zas could have been a bit more generous. So, don’t be afraid to tell your wait staff that you are looking for LOTS of good stuff on your pizza when it arrives at your table! Oh – did I mention the little plates shaped like pieces of pizza? How cool is that detail? 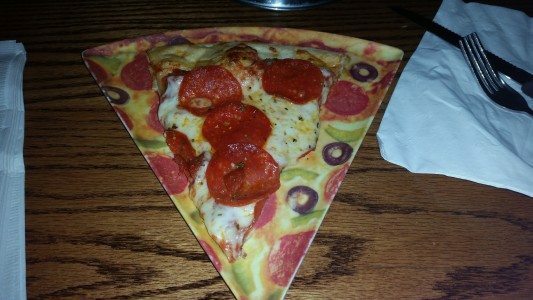 If you and your clan are looking for pizza that combines crust, toppings and sauce in a tasty balance of flavors, look no further than Brickhouse Pizza in Fort Atkinson, a clean, comfy slice of Jefferson County, Wisconsin. Taco sauce, taco meat, mozzarella, cheddar, tortilla strips, lettuce, tomatoes, black olives and green onions. Sour cream and salsa on the side. Canadian bacon and pineapple with a sprinkle of bacon, mozzarella cheese. Pizza sauce topped with spinach, garlic roasted tomatoes, and grilled chicken with mozzarella and feta cheeses. Pepperoni with extra mozzarella, provolone, sprinkled with diced pepperoni pieces. Creamy cheese sauce is layered with tender macaroni noodles and smothered with a mound of mozzarella and cheddar cheeses. Pepperoni, Canadian bacon, sausage, and bacon over tomato sauce and smothered in mozzarella. Steak with crisp onions, green peppers and mushrooms smothered in mozzarella and provolone cheeses all on top of a tasty white ranch sauce. Green peppers, fresh mushrooms, black olives, and onions. Gyro slices, onions, mozzarella, and fresh tomatoes over cucumber gyro sauce. Canadian bacon, onions, green peppers, potatoes, and bacon bits, topped with mozzarella and cheddar cheeses on a buttery crust. Spinach, artichoke hearts, tomatoes, feta, mozzarella, and ranch sauce. Grilled chicken, Canadian bacon, bacon strips, and mozzarella, drizzled with honey mustard. BBQ chicken, onions, bacon bits, and a smoky BBQ sauce all topped with pepper jack and mozarella cheese. Our fresh homemade alfredo sauce smothered undera layer of mozzarella and cheddar cheese, parmesan and chicken.